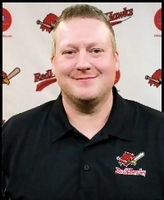 Chad has worked with the RedHawks since 2012, starting out as the media coordinator for the last six seasons as well as operating his own media company. His experience includes various live and post-production video, information technology, graphic design, website creation, and digital advertising. Prior to working for the RedHawks, Chad has worked for Tele-Communications Incorporated, Midcontinent Communictions, WDAZ-TV and KXJB-TV and as a freelance production specialist for ABC News, The Learning Channel (TLC), ESPN, Midco Sports Network, Fox Sports Network, NBC Sports Network, TSN and CBS Sports Network. Chad and his family make their home in Fargo.